This week DC launches a major event that promises to be the biggest story of the Rebirth era to date. 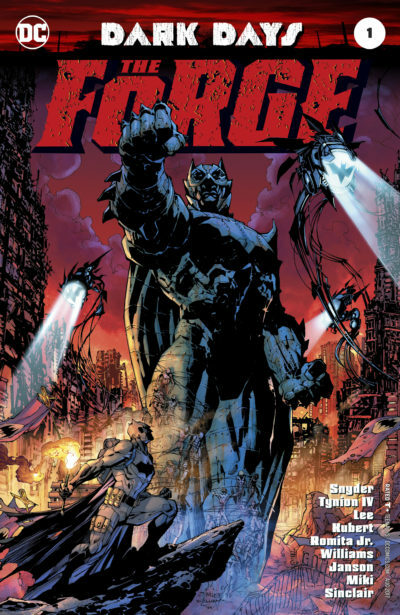 What are the mysteries of Dark Knights: Metal, and is its first chapter Dark Days – The Forge at all accessible to readers not well-versed in DC’s history? DC Comics has always delivered better mysteries than Marvel. Maybe it’s down to their “Detective Comics” namesake, or maybe it’s because none of Marvel’s major characters are as dedicated to unravelling secrets as Batman, but DC Events always seem more mysterious to me than their Marvel counterparts. The Forge is no exception. I went into this quite suspicious that the story would work for me as a minor DC fan. I enjoyed it, despite there being a few elements that went over my head. I think an even newer reader might actually fare better than me, because a lot of my confusion came from knowing just tidbits of some of the stories and being confused about what relied on history and what was introduced. To fresh eyes, this will all have the ring of a story that’s been in motion for years. The central thrust of this issue is that Batman has been exploring a worldwide mystery, possibly spurred on by a revelation Court of Owls. It’s not about a villain or an imminent threat to the Earth, but it’s the sort of ball of yarn he cannot help but unravel. Per his usual M.O., Batman has been keeping other heroes in the dark, bringing them in only as-needed while using his vast resources both as Bruce Wayne and Batman to pursue an answer. He isn’t the only one in the middle of an investigation. Hawkman recounts an unending life of reincarnation as he ponders the mysteries of the Nth Metal. And, Hal Jordan is assigned by one of the Guardians of the Universe to investigate an Earthbound mystery – and it’s no coincidence that the mystery is deep below Gotham City. These three stories are intercut throughout the issue, with each of three artists touching each plot rather than them getting one a piece. The divided art chores aren’t as distracting as you might thing. At points some of John Romita Jr.’s art sticks out for being a little pokey and badly proportioned, but it was several pages before I really noticed that. Also, the inks on Andy Kubert don’t approach the Lee/Williams level of fussiness. Neither stops this from feeling like a cohesive read. Of the three stories, it’s the Hal Jordan mystery that really drives the issue. That’s partially because it dispenses the most information to a puzzled reader and partially because it’s the only plot with a second character for witty repartee, but especially because of the insane final reveal! No spoilers on that here – you’ve got to read the issue. Suffice to say that Jordan’s discoveries in the depths of the Bat Cave connect both to recent mysteries and decades-old DC lore. The most confusing element is probably the second character in Jordan’s tale. Duke Thomas is the last Robin standing after the entire city of Gotham joined forces in a Robin-themed resistance and Batman’s current pseudo-Robin in training. I’ve read a lot of the runs that introduce him, but he’s not really explained here past Hal Jordon mocking him a lot, so a newer reader could be forgiven for not understanding why he’s in the Batcave. Also, I had no idea about Thomas’s mother, or how she connects to other DC history, so a one page interlude about the Mortal Men in Philadelphia went totally over my head. At first I was similarly puzzled by a brief Mister Terrific appearance, but that was mostly because I didn’t recognize him – plus, we get plenty of context on his role here. Same for a brief appearance from Mister Miracle. As for why the issue is called “The Forge”? A forge is where metal is heated so that it may be shaped. Nothing about this issue felt like it was especially focused on heating things up to change the nature of the shape of the DC Universe. I think the promotional cuteness of prefacing an event called “Metal” with an issue called “The Forge” got the best of them. The one questionable choice here is that part of Hawkman’s meta narrative seems to imply some sort of mystical bat connection that dates back to the earliest days of humanity. Marvel already thoroughly messed up Spider-Man with similar malarky. Batman’s origin has proven to be relatively durable when it comes to being shaken up by retcons, so I suspect this will probably turn out fine. 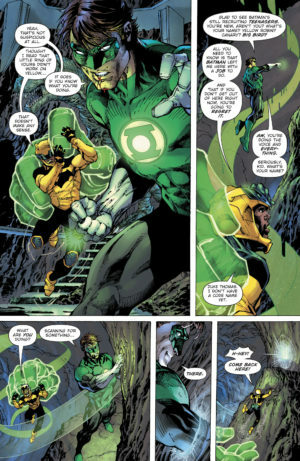 Dark Days – The Forge is very much a first chapter focused on set-up, so there’s a limit to how intensely satisfying it can be. It had the job of framing a massive mystery that will have universe-wide implications, and I think it did the job just fine. It’s clear the scope of this story is going to get even more massive before we reach the main event of Dark Knights, all while pulling in a number of connected plot threads that stretch back through New 52. Having not read Dark Days yet, I’m still a little confused as to what exactly this event’s mystery is actually about. Like, I get the sense that there *is* a mystery…but what marketing I’ve seen hasn’t really amounted to more than “Snyder is doing a DC-wide event.” Which, admittedly, might be all one really needs to know. I think we just have to accept whatever DC throws at us re: Hawkman at this point. Is he a totemic bat/hawk being? A reincarnated Egyptian prince? A spacecop from a planet of other hawkpeople? It depends on the day and probably isn’t worth trying to think too hard about. I’m not too well-versed in DC in general despite being somewhat up on N52/Rebirth, and I got the sense that Batman’s main mystery is somewhat cooked up out of the blue but it’s being used to retcon explain a few dangling plot threads, plus maybe explain one of the three Jokers, plus connect all the various metals used by major DC heroes? Honestly, I know it’s eventually going to an interdimensional place and I have zero patience for those shenanigans, so If I keep up with it you’re going to start seeing 0-star reviews from me at that point. I couldn’t make it more than one issue into Forever Evil.